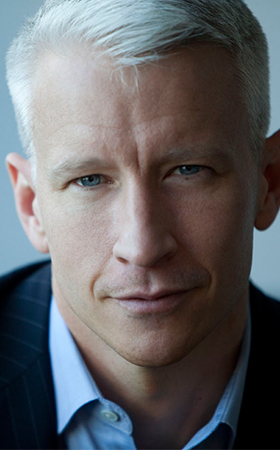 Anderson Cooper is the anchor of CNNs Anderson Cooper 360°, a nightly newscast that goes beyond the headlines  keeping politicians and policy makers honest with in-depth reporting and investigations. The show airs weeknights at 8:00pm ET on CNN. Since the start of his career in 1992, Cooper has covered nearly all-major news events around the world, often reporting from the scene. Most recently, he has extensively covered the conflicts in Syria and Egypt, the NSA surveillance programs, the Boston Marathon bombing, and the Sandy Hook shootings. Cooper has also played a pivotal role in CNNs political and election coverage and has anchored from conventions and moderated several presidential debates. In October 2012 Cooper moderated CNNs Republican debate from Las Vegas. In addition to his shows on CNN Cooper is also a regular correspondent for CBSs 60 Minutes. At CNN and 60 Minutes Cooper has won numerous major journalism awards. Cooper helped lead CNN's Peabody Award winning coverage of Hurricane Katrina and DuPont award winning coverage of the 2004 tsunami. Additionally, he has been awarded 8 Emmy Awards, including two for his coverage of the earthquake in Haiti, and an Edward R Murrow award. Dispatches from the Edge, Coopers memoirs about covering wars and disasters, topped the New York Times' bestseller list and other bestseller charts. Before joining CNN, Cooper was an ABC News correspondent and host of the network's reality program The Mole. Cooper anchored ABC's off-beat overnight newscast World News Now, and was a correspondent for World News Tonight as well as 20/20. Cooper joined ABC from Channel One News, where he served as chief international correspondent. During that time, he reported and produced stories, often on his own, from conflicts in Bosnia, Cambodia, Haiti, Israel, Myanmar, Russia, Rwanda, Somalia, and South Africa. Channel One News was a school television network seen daily in more than 12,000 classrooms nationwide. Cooper graduated from Yale University in 1989 with a Bachelor of Arts degree in political science. He also studied Vietnamese at the University of Hanoi. Cooper is based in New York City.